While the odds of playing at the NHL level are slim for most junior hockey players, even those who have been drafted, the odds aren’t in their favor, there is still a chance. And for some that’s all it takes to keep them playing their hearts out, one game to the next. While the ultimate goal is of course the Stanley Cup for any hockey loving kid from the first time they lace up their skates, for those who have devoted their youth to the sport the prospect of any kind of championship is often the closest they will ever come. For David Musil, Edmonton Oilers’ prospect defenceman, selected 31st overall in the 2011 NHL entry draft, his odds are better than most. With a family lineage that boasts professional hockey players in his father, uncle and grandfather, and a high draft ranking, Musil could very well play a NHL game within the next two years, perhaps even a pre-season game this fall. But that doesn’t mean that winning, or even playing for the WHL championship or the Memorial Cup would have been less sweet. 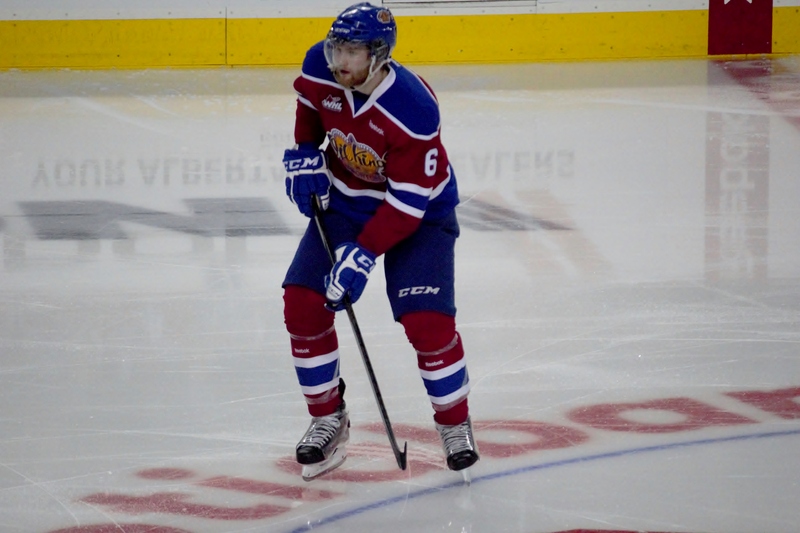 Traded from the struggling Vancouver Giants to the Oil Kings on October 31, 2012 Musil knew that this was his chance to earn one more accolade before embarking on his professional career. And because the Edmonton Oil Kings were on track to make a push for the Memorial Cup for a second year in a row, Musil had high hopes for a long offseason. “I was for sure hoping that I would go as far as I can. It’s a hard thing to win a championship, coming here [to Edmonton] was a great opportunity for me, and I was really looking forward to it. We have a really great team and I just want to do my best and help us get as far as we can.” Musil explained during his team’s 2013 playoff run. A run that saw the defenceman ear 6 assists and 26 penalty minutes in 6 22 games. As we all know, the Edmonton Oil Kings didn’t make it as far as they did last season. Losing a few good men to the AHL, ECHL and international leagues the Oil Kings had to bring up a few newbies and rely on their returning core to take them as far as they could, with the exception of course of traded players like Musil. But the Oil Kings had an established core, and while making room for new players like Musil on paper is an easy accomplishment, having the player learn the new team’s system is another thing altogether. And learn he did. In the end, Musil found his stride and was able to fit in on his new team both on and off of the ice and while he may have set out with the goal of learning, he also did some teaching. Martin Gernat from Slovakia has been working on his English since first arriving in Edmonton to play as an Oil King. But Gernat may have suffered a setback while returning to Slovakia to recover from shoulder surgery. Once he came back to the team, having spoken his native tongue almost exclusively for the better part of a year, Gernat was without his European pal and helpful translator Latvian Kristians Pelss. Pelss had graduated from the Oil Kings to split this season between the Oklahoma City Barons of the AHL and the Stockton Thunder of the ECHL, leaving Gernat to fend for himself. All of that changed however, when Musil came to Edmonton. Musil hails from the Czech Republic and while the two may have battled against each other on the World Junior stage in 2011, they were quick to embrace their similarities while on the same team as Musil became Gernat’s translator and friend. Gernat spoke highly of Musil during the playoffs saying that Musil was a great help in furthering his adjustment to the language and culture of North America. But really it should be of no surprise that young prospects will seek out help, or those who need help, the junior level of hockey is all about improvement and personal improvement also weighs in. It’s not just physical but also emotional growth that will help advance players to success. Musil was one of the Oil Kings to graduate to the Barons for their playoff run. He has signed his entry level contract with the team and while he may not get a chance to play in the AHL playoffs, he will get to practise with the team and get to know a lot of his future teammates. The odds of cracking the Edmonton Oilers’ lineup next season, despite the gaping holes on the blueline, are not in Musil’s favor. Far more likely is Swedish prospect defenceman Oscar Klefbom or perhaps even Slovakian defenceman Martin Marincin if even just for a few callup games. Musil’s foot speed may be an issue at the higher level, but his physical assertion and gritty play will play in his favor. Once Musil is playing with a team who are running at a faster pace on the ice in the Barons or the Thunder, that may be all it takes to help Musil improve his play that much more.